Hillcrest is a modern bungalow which sits at the peak of the hill on the Island of Inchydoney, ensuring some of the most spectacular views in the whole area. To the front of the house, you look out over Inchydoney Beach and the Atlantic Ocean. 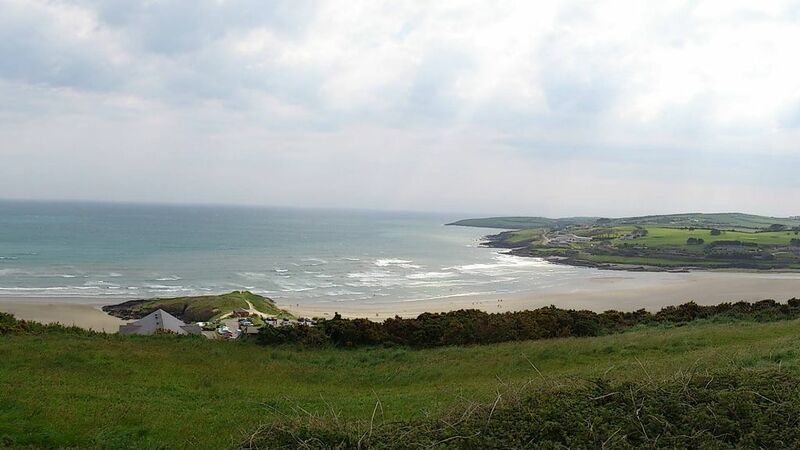 To the rear, you look back across Clonakilty Bay, with a view across neighbouring villages. The house sleeps 6 and has three bedrooms with a queen, a double and 2 single beds. There is a large living room with large 9 foot windows to make the most of the views across the Atlantic. The connected kitchen is well equipped and has a dining table with similar views. It's the ideal location for your perfect break in West Cork, and whether it's romance or adventure you are after, you'll find it all here. Bathroom has a shower enclosure with both boiler operated and electric showers for your convenience. A Gem! Loved the house & the amazing location! We were lucky enough to be some of the first guests at this gorgeous house as it must have only recently come onto the rental market, or just been renovated. It had ample space for our family of four and the views out of each window are stunning. It was heavenly just sitting in the cosy kitchen enjoying our coffee and looking out at the view. We could have sat there all day (and almost did as the weather was pretty poor)! The bedrooms have heaps of storage and there are some lovely touches with pretty bed linen, art and decent furniture. The house, including the kitchen and bathroom, was spotless, thank goodness as I'm a clean freak! We were really delighted with everything, especially given the reasonable rental rates. It's hard to describe how magical the location is. It feels so secluded, but you're not far from some lovely neighbours. We would love to visit again, and are hoping it'll be free when we visit next year - hopefully for longer. There are handy attractions/'things to do' guides in the house, but we know the area pretty well as I used to holiday here as a child. It's so lovely to bring my two little Aussies here and explore the beaches and walk around enchanting Clonakilty. It's close to the Inchydoney Lodge (hotel) and Spa and Dunmore House for good food and craic. Thank youso much for a gorgeous stay. We can't wait to come back. Inchydoney is a small island connected to the mainland by two causeways, situated just outside the colourful heritage town of Clonakilty in West Cork, a region blessed with some of Ireland's most spectacular scenery. Inchydoney’s generous beach is one of the few in Ireland to have achieved the coveted Blue Flag status and is a haven for water lovers. Take a romantic walk, or join the surfers who flock to the beach for its waves. Pop by Ireland's Leading Spa Resort 2010 (World Travel Awards) for a coffee, or visit the many attractions nearby from golf to horse riding, fishing to Clonakilty’s unrivalled traditional pubs.